George Takei Gets His Own Asteroid! Star Trek (and now Heroes) star George Takei has been honored with his very own asteroid. 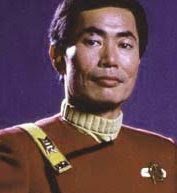 A huge rock floating around between Mars and Jupiter has been renamed 7307 Takei. "I am now a heavenly body. The honor came out of the clear, blue sky - just like an asteroid," he said. The asteroid, which was discovered by two Japanese astronomers in 1994, was formerly known as 1994 GT9. The renaming has been approved by officials at the International Astronomical Union's Committee On Small Body Nomenclature. Shouldn't that be ASREteroid considering his rather strange sexual habits....ie taking it up the wrong 'un?????? I wonder what The Colonel will have named after him?